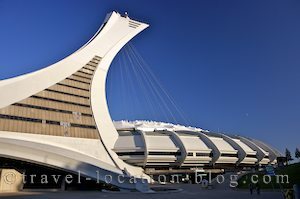 Stadium in the city of Montreal, Quebec, Canada. Our next photo shoot was to various locations in the city. We headed for the Olympic Stadium and Biodome and parked the truck out there for the day since the rest of our tripping around would be via the metro system. The Biodome was our first visit. It's a facility which was once a velodrome used during the 1976 Olympic Games. It's now a major tourist attraction in Montreal where visitors can learn about and walk through replicas of the four eco-systems of the Americas. It's pretty big and each eco-system features the fauna and flora one could expect to see in each. Each section is also temperature controlled: from the humid tropical forest of South America to the frigid climate of the polar regions. Unfortunately, after only about 10 minutes of photography we were asked by security to pack away the tripod which makes it virtually impossible to produce anything. So we picked up the pace as we strolled through then high tailed it out of there to continue on with our city production. The next stop was right next door at the Olympic Stadium, which was where the Genesis concert had been held only days before. The stadium features an inclined tower which at 175 metres (583 feet) is the tallest inclined tower in the world. In that case, we had to ascent to the top of the tower to see what we could see. The top level of the tower provides views of the surrounding area and parts of the city and St Lawrence River but with a window to shoot the camera through, it didn't really help our cause. A short walk away are the Botanical Gardens. During our visit, the 15th annual "Magic of Lanterns" event was in full swing in the Chinese Gardens. Pathways, pools, buildings, and the grounds are decorated with lanterns which are illuminated at night and are a stunning spectacle for visitors. The botanical garden is huge and features several themed areas including a decorative vegetable patch, Japanese garden, rose garden, alpine garden, aquatic garden, First Nations garden etc you could spend an entire day here easily! At the end of our visit and with aching feet we decided to head back to the Biodome and stadium to catch the metro into town and across the river. From the southern banks of the St Lawrence River, we watched as dusk fell over the city and bright lights took over the task of illuminating the metropolis. Meanwhile, only a few metres away, a film crew filmed a man juggling and spitting fire which was quite entertaining. We made our way back to the metro station and headed back into town for dinner before returning to the Biodome to collect our truck and drive home.